Dubai Science Park (DSP), a member of Tecom Group, said it has signed an agreement with Sanofi, one of the world's leading biotech companies, to help raise awareness about rare diseases in the Middle East and develop knowledge and technical capabilities within the health care community. 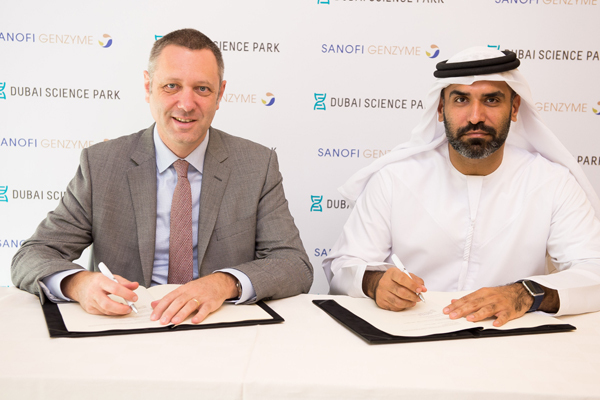 Dubai Science Park (DSP), a member of Tecom Group, has signed a MoU with Sanofi, one of the world's leading biotech companies, dedicated to discovering and delivering transformative therapies for patients with rare and special diseases. The MoU will bring together DSP, the region’s leading community for research and innovation in the sciences, and Sanofi to cooperate, collaborate, and help shape the environment of rare diseases in the Middle East region. According to research by Rare Disease UK, an organisation dedicated to raising awareness of rare diseases, one in 17 people, or 7 per cent of the population, will be affected by a rare disease at some point in their lives. This equates to approximately 550,000 people in the UAE and over 23 million people across the Arab world. Approximately 75 per cent of the people affected by rare diseases are children, 30 per cent of whom die before the age of five which underlines the importance of addressing such diseases and improving the quality of healthcare patients receive. In addition to leveraging awareness of rare diseases and their impact on individuals in the UAE, the MoU between DSP and Sanofi will also look to establish communication channels for patient associations and scientific societies, and develop knowledge and technical capabilities within the industry. Marwan Abdulaziz, the executive director, Dubai Science Park, said: "DSP has come to be recognised as a community where pioneering ideas and cutting edge technology come together to foster growth across the life sciences value chain." "Together with our business partners, we remain committed to playing a role in the transformation of Dubai into a knowledge economy. Our MoU with Sanofi underscores our ambition to drive healthcare solutions that benefit the people of the region," he added. Jean Paul Scheuer, the country chair and general manager, Sanofi Gulf said: "Sanofi has a long-standing commitment to addressing the unmet needs of patients with rare diseases such as Fabry disease, Gaucher disease, MPS I and Pompe disease." "We are honoured to work in collaboration with Dubai Science Park, as we recognise the value of co-operating together, to help shape a positive future for Rare Diseases in UAE and the region," he noted.